This month’s newsletter is very full of information, thanks in large part to the recent successful organization of the Sixth IPSI Global Conference (IPSI-6). In addition to the many interesting presentations and discussions by participants, the conference also saw the welcoming of 12 new IPSI members and 5 new IPSI Collaborative Activities, and the rotation of the IPSI Steering Committee membership. Please see the articles below for more information on all of these important matters. We are also pleased to share news of the publication of Volume 1 of the “Satoyama Initiative Thematic Review”, and also to remind you of the Call for Papers for Volume 2. 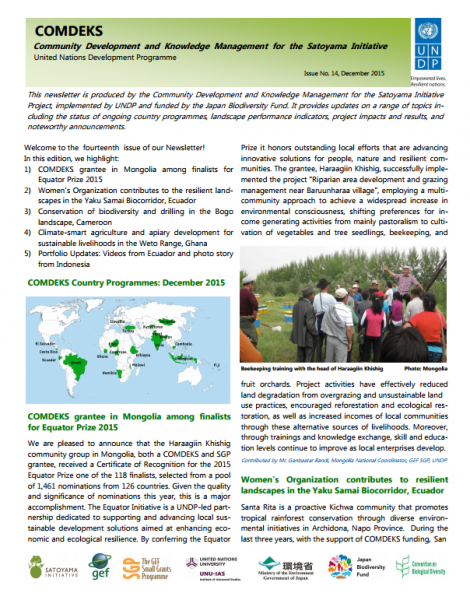 We also have an announcement of the latest volume of the COMDEKS Newsletter. The Sixth IPSI Global Conference (IPSI-6) was recently held in Siem Reap, Cambodia, organized by the IPSI Secretariat and hosted by the Ministry of Environment of the Kingdom of Cambodia. The Conference consisted of a meeting of the IPSI General Assembly, a Public Forum and an excursion for participants. The General Assembly is primarily for information-sharing and decisions regarding the future direction of IPSI, and is open to all IPSI members. Major agenda items this time included the rotation of the IPSI Steering Committee and reporting on the growing number of IPSI members and collaborative activities (see articles below). The theme of this year’s Public Forum was “Planning and reviewing strategic actions for sustainable landscape and seascape management”, and participants in both plenary sessions and working groups provided a large number of interesting presentations on various issues related to SEPLS management. The excursion on 15 January gave participants a chance to see a number of sites from the ancient Angkor city and temple complex. and to consider various SEPLS-related issues discussed during the conference through concrete examples of work being done in the field. The excursion was made possible through the cooperation of the APSARA authority and Live & Learn Environmental Education, who are collaborating on an activity to rehabilitate the stressed water system of the area. We at the Secretariat would like to once again thank all of the participants, and especially our gracious hosts at the Ministry of Environment of Cambodia. It is thanks to all of your help and support that the Global Conference was such a success. A full report of IPSI-6 will be made available in the near future. In the meantime, more information can be found on the IPSI website here. The new members, in addition to being involved in valuable projects in their own right, also help to increase IPSI’s presence by expanding our membership around the world, particularly in Africa – partially as a result of increased attention being paid to the African region since the Satoyama Initiative Regional Workshop in Africa held in Accra, Ghana in August 2015. We look forward to collaborating closely with all of them in promoting the concept of the Satoyama Initiative in the future. IPSI Collaborative Activities are activities carried out by at least two IPSI members (possibly in collaboration with other organizations), and approved as such by the IPSI Steering Committee. At its its meeting in January 2016, the IPSI Steering Committee approved the proposals for five new IPSI Collaborative Activities, bringing the total number of IPSI Collaborative Activities to 34. • Facilitating the Development of a Taiwan Partnership for the Satoyama Initiative (TPSI). Collaborating members: National Dong-Hwa University; SWAN International; Taiwan Ecological Engineering Development Foundation; EEFT. • GEF-Satoyama Project. Collaborating members: Conservation International Japan; UNU-IAS; IGES; GEF Secretariat. Guidelines for the Management of Tara (Caesalpinea Spinosa) Plantations with a view to the Rehabilitation of Waste Lands in the Sub-Humid Tropics of the Coastal Region of Peru. Collaborating members: APAIC; ITTO. Rehabilitation and Sustainable Management of Sacred Forests on Ramsar Sites 1017 and 1018 in Benin. Collaborating members: ONG CeSaReN; ITTO. Sustainable forest management, conservation of biological diversity and promotion of landscapes for socio-ecologic production in indigenous territories of the Uwalcox micro-watershed in Guatemala’s Western Altiplano. Collaborating members: Asociación Vivamos Mejor; ITTO. The “Satoyama Initiative Thematic Review” is a publication series, comprising a compilation of IPSI case studies providing knowledge and lessons related to “socio-ecological production landscapes and seascapes (SEPLS)”. It aims to collect experiences and relevant knowledge, especially from practitioners working on the ground, taking advantage of their potential for providing concrete and practical knowledge and information as well as contributing to policy recommendations. It also includes a synthesis chapter produced to clarify its relevance to policy and academic discussion and to help make lessons learned practical in the field. The Satoyama Initiative Thematic Review vol. 1 was recently published, showcasing various case studies from around the world focusing on tools and approaches for “Enhancing knowledge for better management of socio-ecological production landscapes and seascapes (SEPLS)”, in particular those that are used by and with local communities and other stakeholders to deepen understanding of SEPLS and their management. The case studies demonstrate that appropriate selection and thoughtful use of tools and approaches can provide various different positive outcomes, not merely increasing knowledge but also creating preferable conditions that can lead to effective actions for SEPLS. 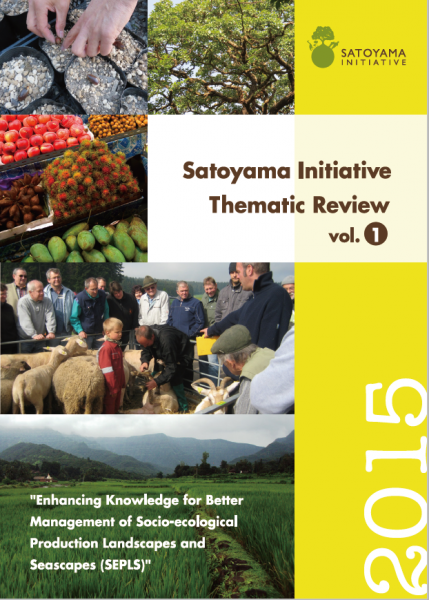 The Satoyama Initiative Thematic Review Vol. 1 is available for download from the IPSI websitehere. The IPSI Secretariat recently announced a call for papers for the second volume of the series “Satoyama Initiative Thematic Review”. The theme of this volume will be “Incorporating concepts and approaches of socio-ecological production landscapes and seascapes (SEPLS) into policy and decision-making”. The second issue of the Satoyama Initiative Thematic Review will invite papers on lessons learned from processes for mainstreaming SEPLS concepts and approaches in policy and other frameworks that broadly affect people’s or organizations’ behavior and decision-making. The mainstreaming can relate to activities at multiple scales of operation (from landscape to provincial to national or regional) that demonstrate how to include SEPLS priorities in relevant policies at the scale of operation. Authors from IPSI member organizations who have case studies relevant to the theme are highly encouraged to submit a manuscript by 22 January 2016. For more information on the scope, timeline, eligibility and submission, please see the IPSI website here. We at the Secretariat would like to extend our sincere thanks to two organizations who are stepping down from the Steering Committee at this time, namely the World Agroforestry Centre (ICRAF), and the TEBTEBBA Foundation. Both of these organizations have given much hard work on behalf of IPSI during their time on the Steering Committee, and we look forward to continuing our collaboration with them in other ways in the future. The new Steering Committee members also met informally on the margins of IPSI-6, and it was decided that Prof. Alfred Oteng-Yeboah from the Ghana National Biodiversity Committee would continue as Chair of the IPSI Steering Committee. We at the Secretariat would like to express our sincere gratitude to Prof. Oteng-Yeboah for his past and ongoing guidance.